The menopause is the permanent cessation of menstruation resulting from loss of ovarian follicular activity. Usually, menopause occurs at 45-55 years old in western countries, and a few years earlier in developing countries. The age of onset of the perimenopausal period is about 45-48 years old and it lasts about 3.8 years. Genetic risk factors can lead to a real premature ovarian failure (POF), meant as the onset of menopause before 40 years old. A woman is in menopause when there are no menses for 12 consecutive months, with no obvious cause (such as pregnancy and lactation), which defines the woman’s last menstrual period (FMP) (link). Compared to the normal menstrual cycle, in the menopausal period there is a 10-15 fold increase of FSH, a 4-5 fold increase of LH and a 90% decrease of E2 (link 1, link 2). Authors demonstrated an inverse correlation between circulating INH-B and FSH. With the woman aging, in fact, levels of INH-B decrease, while FHS continues to increase (maximum levels at 40-45 years old) (link 1, link 2) . When the woman reaches a marked decrease in ovarian follicle number, INH-B level falls. This marks the entry into menopausal transition (link 1). 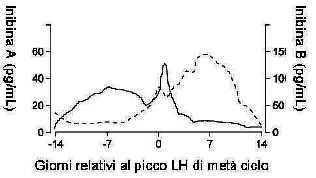 The fall of INH-B, in fact, is due to the fall in the size of the recruited cohort of follicles or to a decrease in the ability of granulosa cells in the older women to secrete INH-B, or both (link 1). During the perimenopausal period, the level of INH-A decreases as well, accompanied with a decrease of E2 (decrease that will continue also in the postmenopausal period) and an increase of FSH, suggesting an inverse correlation between FSH and E2 and FSH and INH-A too (link 1). Activin and inhibin are dimeric proteins involved in the regulation of the menstrual cycle. Following purification and molecular characterization, these hormones were identified as members of the TGF-bsuperfamily, which now includes more than 40 ligands including TGF-b , inhibin, myostatin, and bone morphogenetic proteins. Inhibin: molecular weight of 32,000 daltons, and consists of one alpha-chain (approx 18 kDa) and one beta-chain (14 kDa) linked by disulphide bridges. The subunits alone possess no known biological action. Activin: β subunits are synthesized as precursor molecules with 350-426 amino acids and molecular weights between 38 kDa and 50 kDa. The prodomains are removed in the ER and in the early Golgi by members of the protease family of subtilase-like pro-protein convertases (SPC) to release mature peptides with either 115 (βB, βE) or 116 (βA, βC) amino acids. 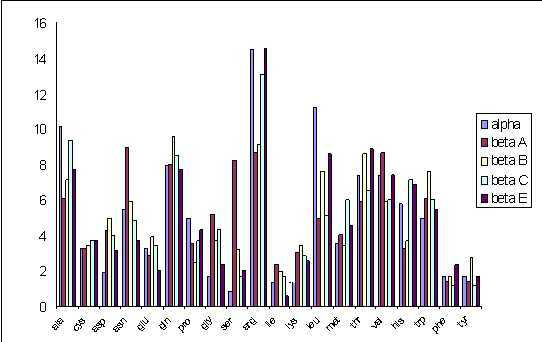 The amino acid sequences of the mature peptides are approximately 50% conserved among the four human β subunits, whereas the sequence homology in the prodomain is only about 20%. The alpha and beta subunits share approximately 25% sequence similarity, whereas the similarity between beta subunits is approximately 65%. The subunits alone possess no known biological action, and each subunit is produced from a separate gene. to a number of different dimeric inhibin forms. While the biological significance of these multiple forms is not clear, the inhibin dimeric forms appear to have similar biopotencies. This protein interacts with transmembrane receptors (Types I and II – iHOP) which have intrinsic serine/threonine kinase activities in their cytoplasmic domains. 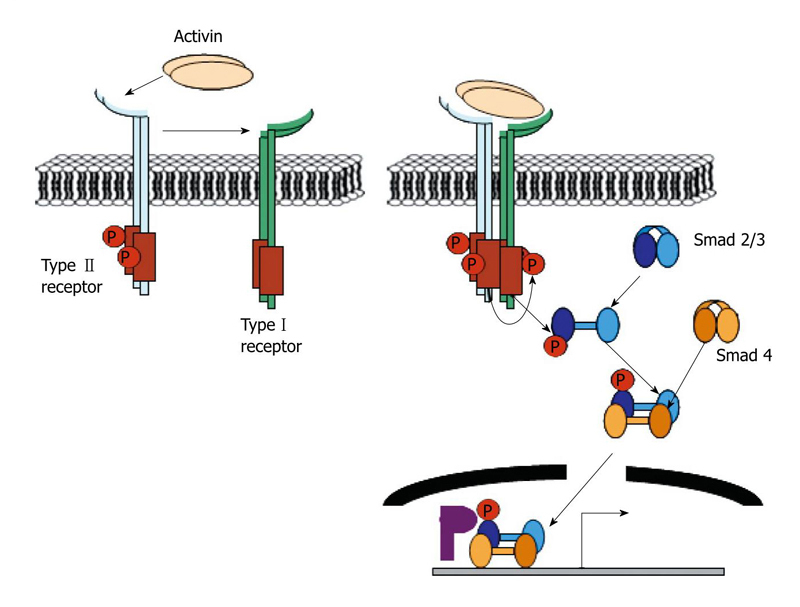 Activin binds to the Type II receptor and initiates a cascade reaction that leads to the recruitment, phosphorylation, and activation of Type I activin receptor. This then interacts with and then phosphorylates SMAD2 and SMAD3, two of the cytoplasmic SMAD proteins. SMAD3 then translocates to the nucleus and interacts with SMAD4 through multimerization, resulting in their modulation as transcription factor complexes responsible for the expression of a large variety of genes. Activin and inhibin have opposing biological effects. FSH is the main hormone of granulosa cells differentiation. This gonadotropin induces in these cells the aromatase, an enzyme able to catalyze the conversion of androgens into estrogens synthesized by theca cells. FSH is also important for the induction of LH receptors in granulosa cells. Activin and TGF-b stimulate the expression in these cells of FSH receptors. The induction of aromatase causes an increase in estrogen level, which reduces FSH circulating levels below the threshold needed to stimulate the maturation of other less mature follicles. The concomitant induction of LH receptors in the mature follicle provides an additional source to support the growth. That makes it able to continue growing while FSH levels is inadeguated to support the development of other follicles. FSH stimulates the synthesis of estrogens, follistatin (activin-binding protein, which suppresses the bioactivity of activin) and inhibin, and reduces the production of activin by granulosa cells. The increase in peripheral levels of inhibin and the reduction of FSH serum concentration can produce atresia of other less mature follicles. Hormones in synergy: Regulation of the pituitary gonadotropin genes. cell proliferation, even in neurogenesis. differentiation, for example in the differentiation of embryonic stem cells into endoderm and pancreatic progenitors, or in the regulation of thymocyte developement. apoptosis, Activin A resulted in a significant time-dependent decrease in Bcl-2 mRNA levels and increase in caspase-3 mRNA levels in SNU-16 cells (human gastric cancer). That revealed that activin inhibits the growth by inducing caspase activation. metabolism, like in bone metabolism. homeostasis, like in epidermal homeostasis. anti-inflammatory role, as well as results reveal that activin signaling may play an important role in the pathogenesis and resolution of colitis. immune response: it has been demonstrated that immune cells infiltrating the lungs from individuals with active allergic asthma, and thus non-regulated inflammatory response, exhibit significantly decreased expression of activin-A’s responsive elements. wound repair: it has been shown that activin over-expression in the skin of transgenic mice enhances the speed of wound healing and the scarring response. Activin inhibits telomerase activity in cancer. Studies have shown that activin A treatment of breast cancer cells arrests cell growth. Inhibin is generally considered as a tumor suppressor, but its possible role in the breast is less understood. Serum levels of inhibin have been shown to reflect the size of granulosa-cell tumors and can therefore be used as a marker for primary as well as recurrent disease. However, in prostate cancer, expression of the inhibin alpha-subunit gene was suppressed and was not detectable in poorly differentiated tumor cells. Furthermore, because expression in gonadal and various extragonadal tissues may vary severalfold in a tissue-specific fashion, it is proposed that inhibin may be both a growth/differentiation factor and a hormone. Inhibin down regulates FSH synthesis and inhibits FSH secretion. It is secreted by granulosa (female) and Sertoli (male) cells. In women, inhibin, whose secretion is stimulated by FSH, suppresses FSH. Inhibin secretion is diminished by GnRH, and enhanced by insulin-like growth factor-1 (IGF-1). Inhibin A reaches its peak in the mid-luteal phase; this suggests that inhibin-A is primarily of luteal origin. In males, it is a hormone that inhibits FSH by negative feedback. It is secreted from the Sertoli cells, located in the seminiferous tubules inside the testes. Androgens stimulate inhibin production; this peptide may also help to locally regulate spermatogenesis. Regulation of inhibin/activin expression in rat early antral follicles. Regulation of interleukin 1alpha, activin and inhibin by lipopolysaccharide in Sertoli cells from prepubertal rats. Within the human reproductive disease field, the measurement of inhibin has become a new way to monitor reproductive function. Most obvious is the decrease in fertility before ‘aging’ women reach menopause. This has been related to an increase in pituitary FSH output in older women, which is not explained by changes in ovarian steroid hormone secretion. Inhibin-B concentrations are lower in older women, inhibin-A concentrations change little, and activin concentrations are higher. The combined effect of these changes can explain the increase in FSH. This too is associated with elevated FSH concentrations, although both testosterone and inhibin-B decline with age in similar patterns, inhibin-B has been suggested as a marker of testicular function. Serum inhibin has been positively correlated with sperm count, testis volume and testis histology. In women, inhibin-A is secreted by the feto-placental unit, as evidenced by increased concentrations during pregnancy. Significant increases are observed by 6 – 8 weeks. Multiple pregnancies result in higher inhibin-A concentrations than singleton pregnancies at 8 – 10 weeks. Inhibin-A secretion is dependent on the presence of a live fetus, as concentrations do not increase as normal in cases of early fetal loss; it may thus be a good marker for monitoring IVF pregnancies. In some but not all studies, inhibin-A and inhibin-B concentrations were lower in follicles from women with polycystic ovarian syndrome (PCOS) compared to healthy follicles. Plasma inhibin-A and inhibin-B concentrations were reported to be higher in women with PCOS compared to controls. It was suggested that in normal women, inhibin-B is secreted in pulsatile manner (corresponding to FSH pulses), whereas this pulsatile pattern is lost in PCOS. Inhibin-B concentrations are significantly elevated in patients with granulosa cell tumors, but normal in patients in clinical remission. In contrast, inhibin secretion is not affected by epithelial cell cancers (as epithelial cells do not synthesize inhibin). secretion would increase FSH concentrations and thus offer potential for increased fertility. Domestic ruminants have been immunized against a variety of inhibin preparations, and small increases in ovulation rate have been reported in cattle, sheep and goats. However, the responses are far from superovulatory, and this approach to fertility management is not widely used. The endometrial expression of activin A and follistatin mRNA is lower in women with DUB. Both activin A and follistatin are measurable in high concentrations in human menstrual blood and are relatively lower in women with DUB. The quantitative assessment of activin A and follistatin in menstrual serum might be a putative clinical marker of endometrial function. Some authors have shown that the secretion of inhibin B was significantly reduced in women with endometriosis and this would lead to the recruitment of fewer follicles and / or abnormal follicular maturation.